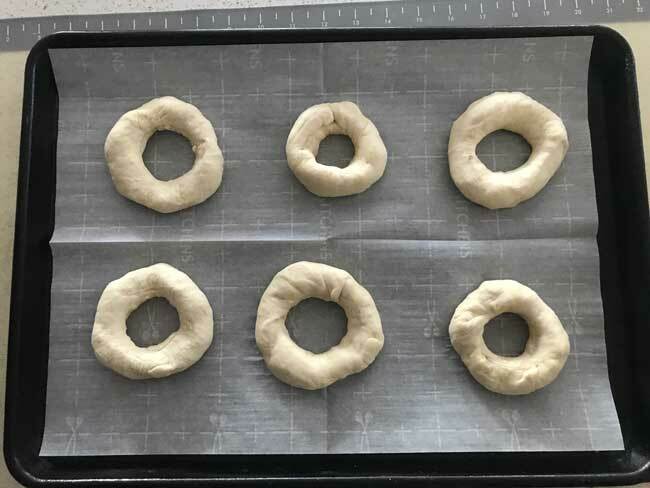 Making homemade bagels is a lot of fun, and over the years I’ve tried so many different recipes including ones with diastatic malt powder, barley malt syrup or super-high gluten flour — you name it. It’s always fun testing tricks of the trade, but at the end of the day it seems my favorite bagels are made with a pretty basic recipe that doesn’t call for any hard-to-find ingredients. Originally from Good Housekeeping, this recipe is easy if you have a stand mixer with a dough hook. The original version is double this, but I always make 6 at a time which is usually more than enough for a family of three. So feel free to double! Our family loves these bagels, and even though they aren’t exactly “authentic New York style”, they’re still chewy and flavorful and perfect for topping with cream cheese, lox, peanut butter or whatever you like. The trick to making these is, as with most yeast breads, is getting the flour to liquid ratio just right. 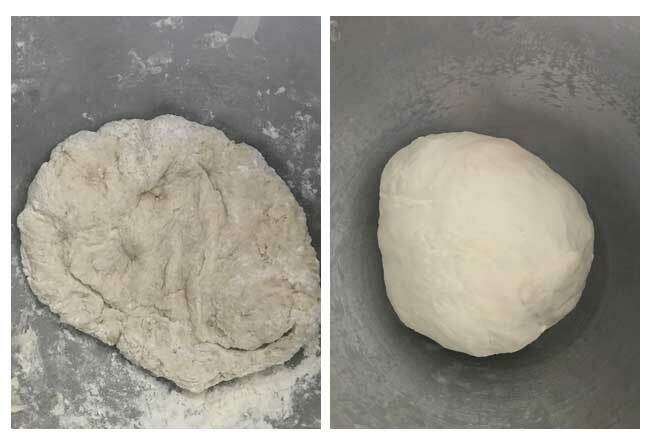 The dough needs to be pretty stiff and should go from something like the first photo to the second. Shaping bagels also takes some practice. Some bakers like to make snakes and attach the ends to make loops, but I like to make balls and punch holes in the middle. You can use whatever method feels comfortable to you. If the dough is just right, you shouldn’t need any oil or flour to prevent sticking. Another reason I like this recipe is because the boiling water bagel bath calls for a tablespoon each of honey and molasses rather than a lot of baking soda. For some reason I find the honey and molasses a little more convenient (and maybe slightly better tasting) than the baking soda. To store the bagels, just put them in a freezer bag and freeze. These bagels can be made with regular yeast packets or Rapid Rise (instant yeast). I almost always use instant, so the instructions are for instant. If using regular yeast, dissolve it in the water and increase the rise times. Put 250 grams of the flour (2 cups) in the bowl of a stand mixer bowl with the salt, sugar and yeast. Stir well, then add add all 5 oz of hot water and 2 tablespoons of milk. Stir by hand to make a soft dough, then add remaining flour 1 tablespoon a time as kneaded until dough is stiff enough to knead. Attach dough hook and let the machine knead the dough until it is smooth and elastic. It should not be sticky, but rather stiff enough to leave the sides of the bowl as the machine kneads it. Once the dough is smooth and elastic (5 to 8 minutes depending on your mixer), you can simply cover the bowl with plastic or if you prefer, transfer the bowl to a second lightly greased bowl. Allow dough to rise for about 45 minutes or until doubled in bulk. Punch down the dough and divide it into 6 sections. Shape each section into a ball, then poke your finger through the center and twirl the dough around your finger to form a loop with a hole about 2 inches in diameter. The holes will shrink as the bagels are boiled and baked, so at this point the holes should seem quite large. Set the bagels on a baking sheet lined with parchment paper and cover with a greased sheet of plastic wrap. Let rise for about 25 minutes. Bring 12 cups of water to a boil and add 1 generous tablespoon of honey and 1 tablespoon of molasses. Reduce heat to a simmer. Add as many bagels as will fit to the water and simmer for 2 minutes, turning halfway through. Drain with a slotted spoon (or spatula) and return to the parchment lined baking sheet. Bake the bagels for 20 minutes or until they are golden brown and the internal temperature measures at least 205. Banana Nut Variation: Use only 1/2 cup water total and also omit the 2 T. of milk. Increase sugar to 1 1/2 tablespoons total, reduce salt to 1 teaspoon and use 4 oz/114 grams mashed very ripe bananas. During the end of the kneading process, throw in 1/3 cup walnut pieces. Toppings: For an everything bagel, mix a few tablespoons of minced garlic, dried onion flakes, poppy seeds and sesame seeds in a small bowl. Add enough water to cover, then let the mixture sit for a few minutes and soften. Mixture will be quite wet, but this keeps it from burning. 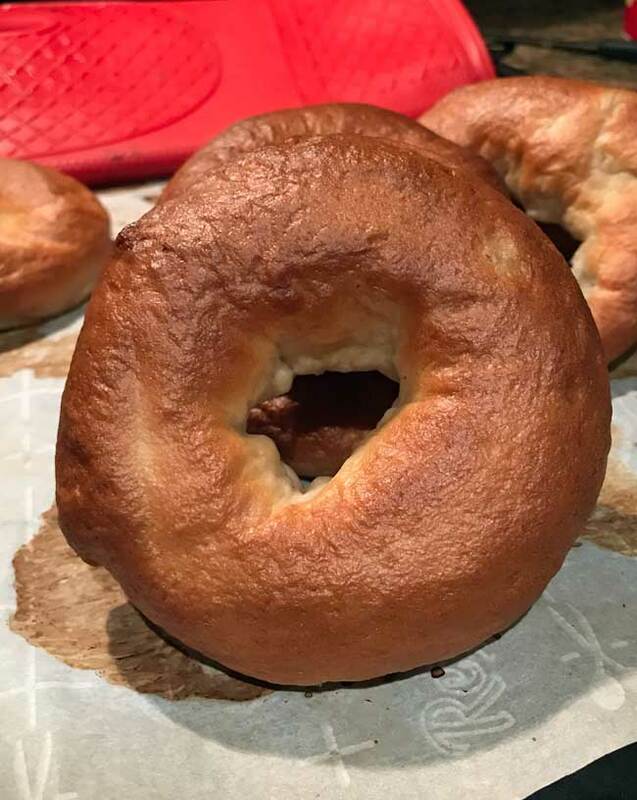 For chewier bagels, use the overnight method. Instead of instant yeast, use active dry yeast (no need to dissolve it). After kneading the dough, put it in the bowl as directed, cover, then refrigerate overnight. Punch down cold dough the next day, then shape and follow directions as written. I’ll echo what Sue says about adding the honey and molasses. 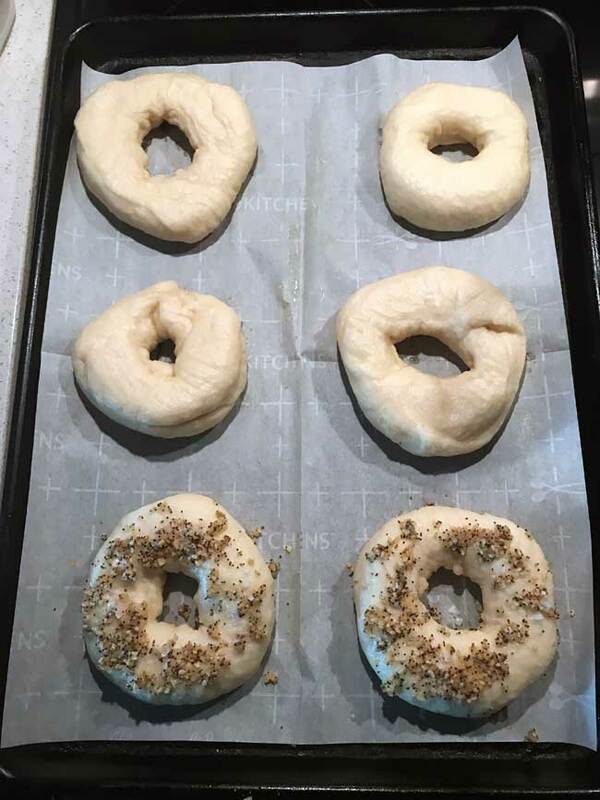 Recently, I heard an interview on the podcast, “Splendid Table,” (https://www.splendidtable.org/story/bagels-past-and-present-with-chef-dianna-daoheung) about how New York-style bagels are losing their flavor and how different ethnic groups brought their own techniques to bagel making. The chef interviewed offered her own take on a “Montreal-style” bagel, which also incorporates the use of honey. Anna, your bagel is probably one-of-a-kind, but I had no idea that there were regional bagel trends. Your recipe is way above my level, but I bet they beat out any store-brand. When I was very young, we moved from Mn. to CA. We lived in a neighborhood that was 99% Jewish, we were the only family that didn’t celebrate all the holiday’s etc since my father was a protestant minister. The one childhood memory was that if we filled the S&H stamp books we would be rewarded with Bagels. I am an avid baker especially breads and bagels have always been on the bucket list but it only took half a century to finally make them. With the weather in Chicago, it was as if I were doing the cold rise instead so i’m sure once the heater reheats the house again things might have been different. I do like the idea of the honey and molasses I have to wonder if it would be a good option for pretzels too. Sue, I’m pretty sure I made those as well and they were very good. These bagels are very chewy and the salt and sugar add a lot of flavor, so they’re what you’d expect a bagel to be. They lack the malt flavor, but they have touch of honey/molasses that makes up for it. In the note I say “for chewier bagels” you can use active dry yeast and chill the dough overnight. I haven’t done that in a while. The bagels are still good without an overnight chill. I haven’t made bagels in a very long time. I should put these on the list to try. We don’t have a good bagel place here and we can’t always get my husbands favorite at the store. I think the best ones I’ve made were a Peter Reinhart recipe. I like the idea though of using honey and molasses in the water bath.